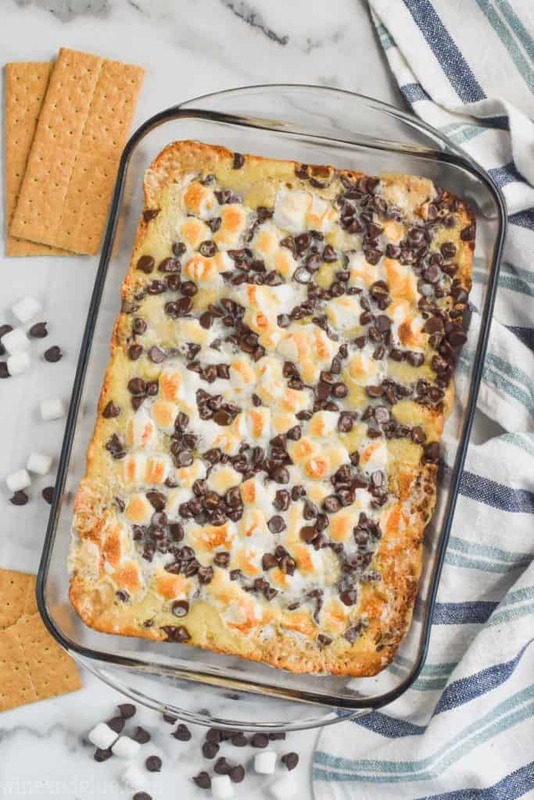 These S’mores Magic Cookie Bars will disappear almost as fast as you can make them, they are irresistible! 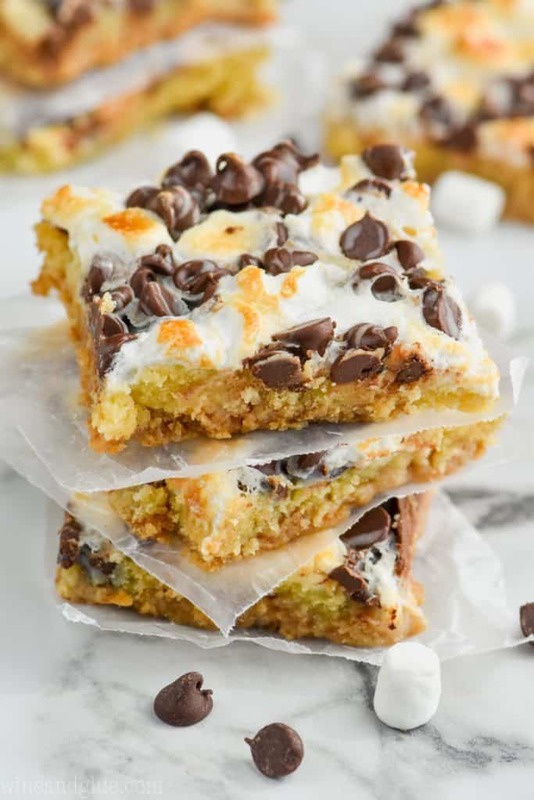 Made up of absolutely amazing layers of graham cracker, sugar cookie, chocolate, marshmallows, and topped with sweetened condensed milk, there is a LOT to love about these! 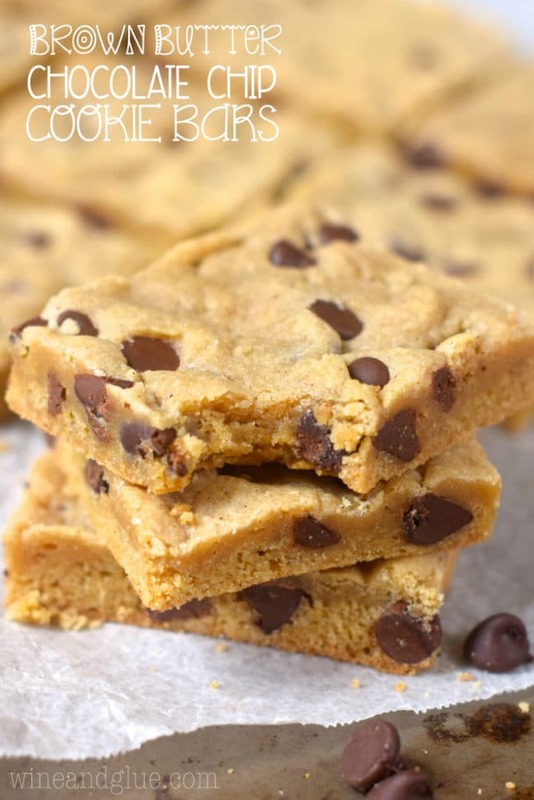 If you need another amazing bar recipe be sure to check out my Brown Butter Chocolate Chip Cookie Bars. I love making magic bar variations! Actually, scratch that, I love making variations of all sorts of desserts. Like I have a million and one variations on fudge recipes and poke cakes too!. But magic bars . . . . oh yummy. I made Milky Way Magic Bars when I was very early on in my blogging career. I also have these incredible Chocolate Covered Cherry Magic Bars. And then of course, these Strawberries and Cream Magic Bars went crazy viral. Because magic bars are actually magical. But you guys. I forgot how amazing these S’mores Magic Cookie Bars were until I recently decided they needed a video and to be re-photographed. WHAT IS THE MAGIC BAR? Traditionally, magic cookie bars are a seven layer bars with graham crackers, chocolate chips, nuts, coconut, and sweetened condensed milk. I mean . 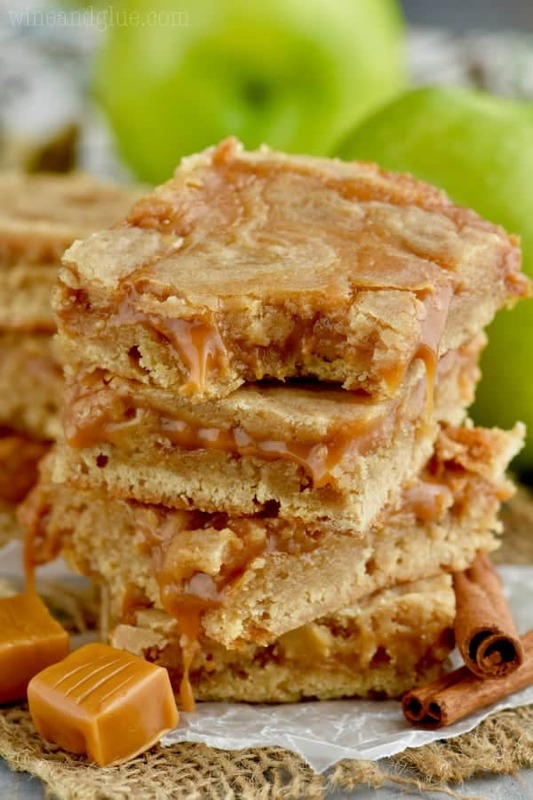 . . there is for sure a reason why these dessert bars are called magical. Because of the make up of the original recipe, it’s easy to come up with a ton of variations on these bars. I love throwing a thicker layer in the middle of my magic bar recipes. 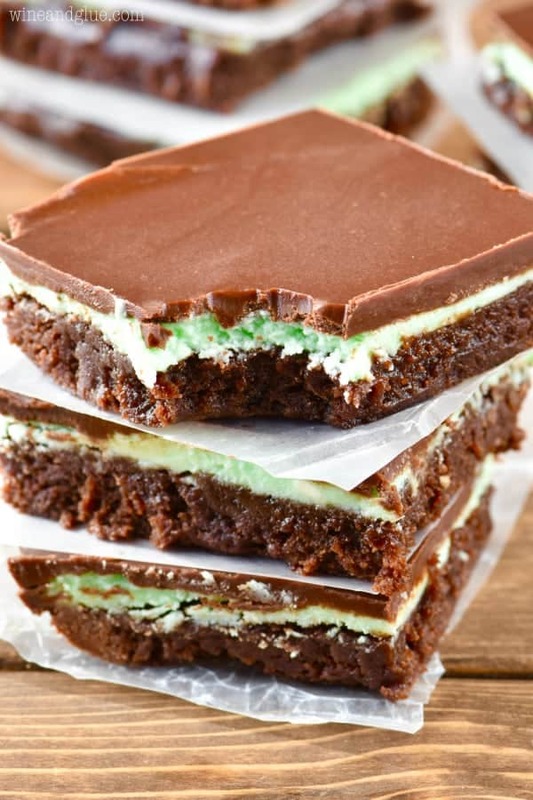 Usually a brownie or cookie layer, it gives a little something extra. In these S’mores Magic Cookie Bars, I went with a sugar cookie layer. It makes for a truly decadent amazing dessert. Guys, a little goes a long way with these guys. You are going to want to cut them into small bites. And then if you are me, go back to the pan over and over and over again until you beg your husband to take the whole pan to work. You are basically making cookies from scratch to shove in the middle of these magic bars, so these tips might come in handy. Room temperature butter means that you can dent the butter easily with your finger but can’t push it all the way through. To bring your butter to room temperature fast, cut it into one inch pieces and leave it on the counter for a half hour. Measure your flour by scooping it into the measuring cup and then leveling off. This will prevent the flour from packing (if you scoop right from the container), and ending up with a recipe with too much flour. When it comes to the baking time, you are going to have to keep an eye on these guys. Oven temperatures can vary, making a big difference in how long these need. Mine baked close to 27 minutes, but from 22 minutes on, I was checking on them and waiting to get a nice golden edge around them. 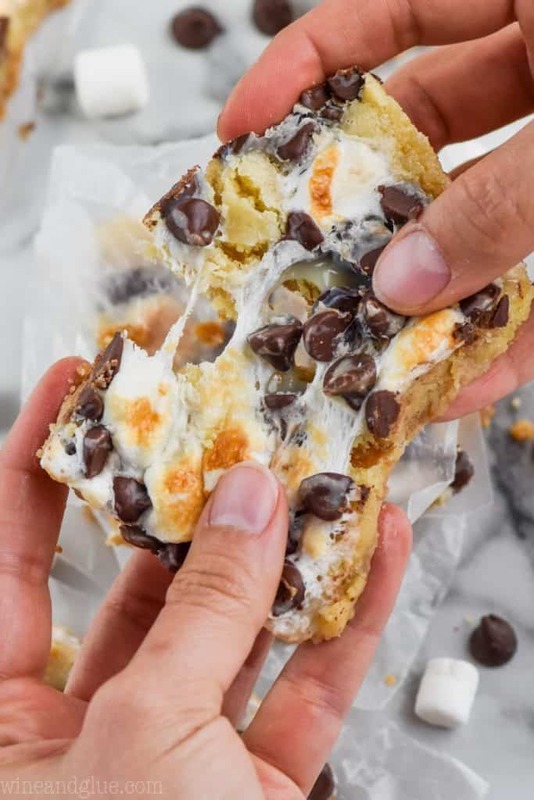 These S'mores Magic Cookie Bars will disappear almost as fast as you can make them, they are irresistible! 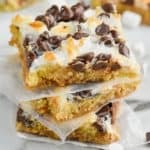 Made up of absolutely amazing layers of graham cracker, sugar cookie, chocolate, marshmallows, and topped with sweetened condensed milk, there is a LOT to love about these! Preheat your oven to 350 degrees. Spray a 9 by 13 inch pan with cooking spray well and set aside. 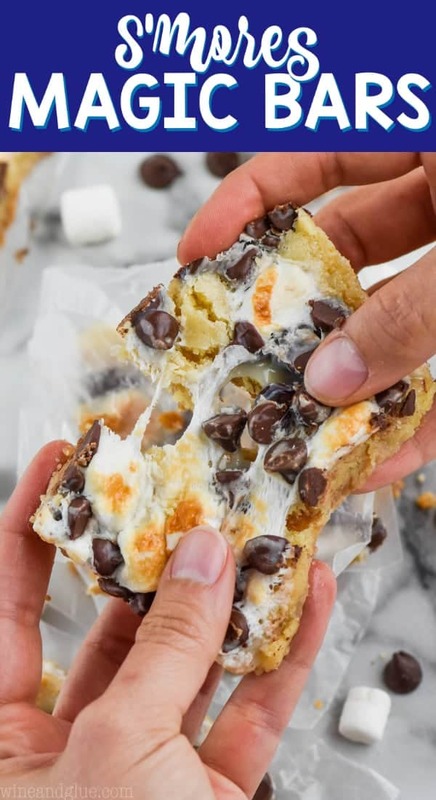 Evenly spread the mini marshmallows and the chocolate chips over the top of the cookie dough. Then evenly pour the sweetened condensed milk over the top. Let the bars cool overnight before cutting. Or just take a fork and go for it. I love the childhood nostalgia that comes with s’mores and this recipe is such a fun take on the classic recipe! I don’t care if it sets, I want one anyway! Thank you for sharing this yummy recipe. Those marshmallows and chocolate chips look divine and oh so delicious! PINNED! I just put these in the oven however, when I went to look at them the marshmellows were browning too much on top so I put some foil over the pan, Has this ha? Made half portion last night. Both husband and I agree, this was delicious!! I’m so glad to hear that Melissa! Thank you for taking the time to let me know! …And we have the second batch (in one week) in the oven tonight! These things are so so so good! My family requested them again (and that is one wish I was more than happy to grant). I add a layer a peanut butter cause I like it on my s’mores. I seriously can’t get enough of these bars! If anyone can actually let them cool and set, he has the patience of a saint. I’m standing by the oven waiting to be able to dig in with a spoon! We discovered your blog on Pinterest. We love it! Thanks! Leetra, this comment totally made my day. I even it showed it to my husband. Thank you so much for taking the time to come back and leave it! I haven’t tried freezing them, but I think it would be fine. Freeze in a single layer with some paper towel that can absorb the extra water while defrosting. Hi do I need to let Cool In fridge before cutting?? They do need to cool before cutting, but they can cool overnight on the counter. Just cover once they aren’t piping hot anymore. Do I let them cool on the counter or do I stick them in the refrigerator? I just let mine cool on the counter over night. They don’t need to cool if you eat them with a spoon and blow on ’em! Yummy! Lynette, this comment ABSOLUTELY made my day yesterday. Thank you! LOL! I love this comment, Sue!! Tell your husband I get it. Making these right away! Yum Yum Yum! I hope you like them Daynica! This is just a personal preference but I like the marshmallows less brown. I found pouring the sweetened condensed milk over the marshmallows made them too brown. I think I would put the marshmallows on last. These are seriously one of the BEST deserts I’ve ever eaten, much less made!!! And they are so easy. They are totally addicting. Thanks so much for sharing! They are my new favorite desert. ???? Love these bars!! Don’t add extra sweetened condensed milk or it will make them gooey. I cooked mine a little longer than the recipe called for and they were perfect. Everyone loves them!!! This totally made my day, Carolyn! Thank you! You have condensed milk on the list but it doesn’t say where to add it in. 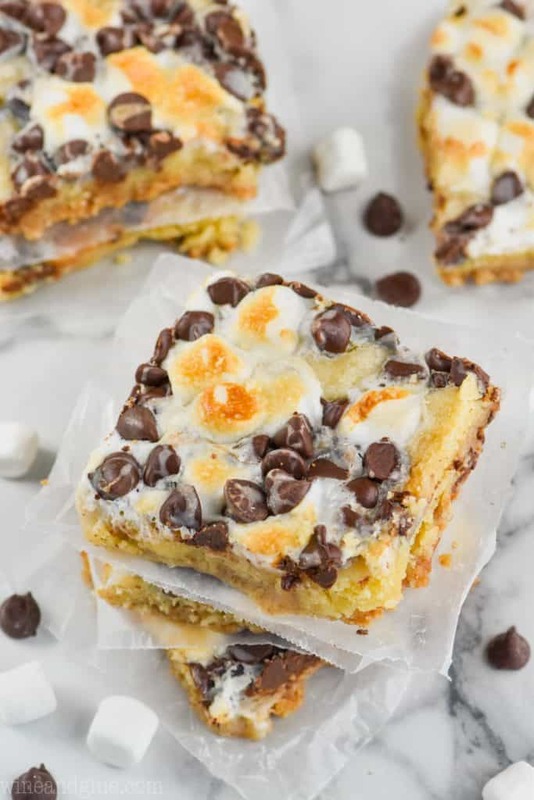 These S’mores Magic bars are amazing! Thanks so much for sharing your recipe. It became a family favorite. Thank you so much for taking the time to come back and tell me Monica! This makes my day! I made these for a funeral and they were delicious! And a HUGE hit. But i’m Wondering if they can be frozen? I’m doing all the desserts for a wedding and they’ve requested these. Just trying to get a head of the game. I haven’t tried freezing them, if you do, let me know how it turns out! Hello! I made these bars last night. I baked them for 25 minutes. I left them to cool on the counter overnight. When I cut them this morning, the cookie part didn’t seem to be done. Is that the way they are supposed to be? I am supposed to take these to work today but I don’t want to if they aren’t done. Thank you! Becky, I’m sorry the cookie part wasn’t done. That layer definitely is on the softer side, but it shouldn’t seem raw. Without being there its hard for me to know where things might have gone wrong. I will say that oven temperatures do vary, so that could be to blame. I don’t normally leave a comment but these were just too good not to! I have tried different smores bar recipes and sometimes theyre dry & crumbly or dont taste much like a smore, these checked every box!! Gooey marshmallows, melted chocolate & graham crackers. Maybe I have an extreme sweet tooth cuz in the recipe it said: very rich take small pieces 🙂 um no take a giant piece so you dont have to go back 3 times they’re just that amazing!! Erma, I got this comment at the end of the **worst** day, and it totally changed my mood. Thank you so much for taking the time to come back and let me know! It seriously made my day. WOW!!!!!!! I’m really having to use some serious will power not to go back and eat the entire pan right now. These are amazing! My husband, who doesn’t usually get super excited about food, LOVED these. Mmmmmm!!! I cooled them quickly by popping them in the freezer for 30 minutes and then thawing a few minutes on the counter before cutting. Worked great! I’m so happy you liked them Andrea! I just took mine out of the oven, I’m not sure if they turned out right, bc the marshmallows are crunchy and not gooey? I took them out of the oven when it said to, thought at first Mabey I should have poured the condensed milk over the top but reread and I did it correct. I’ve never had them before so not sure if they will get soft and gooey after sitting overnight? But even if they don’t, i wont be mad, bc all things s’mores are yummy!! Thanks for the recipe! The sweetened condensed does get poured over the marshmallow layer before it goes in the oven. I hope they turned out okay! I am loving this smores magic bar recipe. I made it this New Year’s Eve Party celebration. My kids love it and they won’t stop eating. Thanks for this. Merry Christmas and Happy New Year! Xoxo. We shared this smores magic bars this holiday season. Everyone in the family loves it! Every bite burst with happiness, it’s like the heaven opened its gates. This is so good, so thumbs up!